Rotational animation of Ceres made from Dawn images . Credit: NASA/JPL-Caltech/UCLA/MPS/DLR/IDA. NASA’s Dawn spacecraft is just a few days away from getting snagged by the pull of Ceres, a dwarf planet existing amongst the asteroids. As it’s approaching via the slow but steady thrust of its ion engines Dawn is getting better and better images of Ceres, bringing the world’s features into focus. But on Friday, March 6 (at 7:20 a.m. EST / 12:20 UTC) it will finally feel the gentle tug of Ceres’ gravity and will soon become the first spacecraft to enter orbit around two different targets. 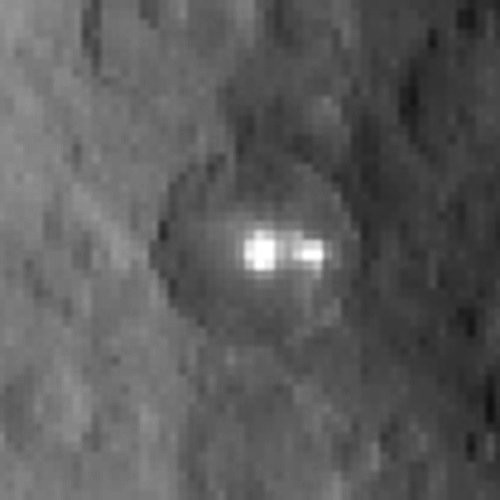 One of the biggest mysteries that has arisen during Dawn’s approach to Ceres is the true identity of the two bright spots located within a crater on its northern hemisphere. Shining like the eyes of some nocturnal creature, the bright region was first seen in Hubble images captured in December 2003. Now Dawn has gotten close enough to resolve it into two separate spots, one brighter than the other… but not much more is known about its true nature yet. Earlier today (March 2) members of the Dawn team held a press conference at JPL in Pasadena to discuss the mission. During the conference the topic of the bright spots was quickly raised by reporters. According to Deputy P.I. (principal investigator) Carol Raymond, the spots “might be related to water vapor emissions” previously observed by the Herschel Space Observatory in March 2013. But Ceres isn’t likely to be another Enceladus – the volume of the water vapor observed and the rate of its escape is nothing like what’s witnessed on Saturn’s ice-covered moon. And as far as cryovolcanism is concerned – that is, ice volcanoes like those suspected to exist on Titan – the structure around the spots doesn’t currently point to that process; they both appear to be embedded within the floor of a crater. It’s thought that the source of the shiny areas are some form of high reflectance material, such as water ice or salts. Whatever the bright spots do turn out to be, as far as we know they are “unique in the Solar System,” according to Raymond. 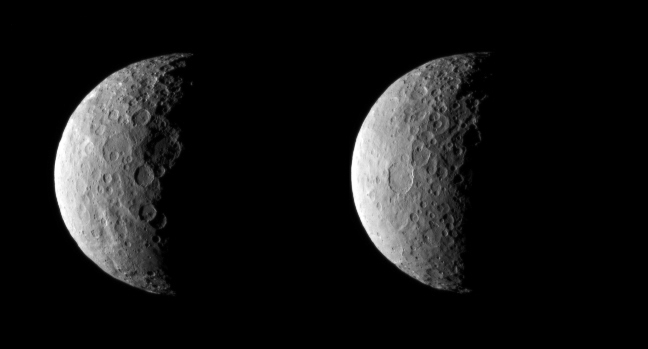 Currently Dawn has moved around to the “dark side” of Ceres and no images are being taken. We will have to wait for it to emerge to receive any more data. Watch the full video of the March 2 press conference here, and watch a Hubble Hangout with my friends Scott Lewis and Keri Bean (a member of the Dawn science operations team) on location at JPL here. Also check out a video about Dawn featuring Mission Director Marc Rayman and Deputy PI Carol Raymond below. This is going to be one exciting year!